Among the many migrant birds, bluebirds are my favorite. I like feeding bluebirds for two reasons: their strong colors are perfect for photography and their food choices are easy to find. If you are biased over the hues of blue, red and yellow colors, then this bird is for you as well. I know I am. The bluebird does not only reflect the sea and sky when they fly, they also represent life. They are also known to be popular among bird watchers because they are good singers. But if you are already lucky enough to have this blue colored thrushes as guests at your backyard, then that’s good. The only issue left is when to find the best bluebird feeder so you can attract these beauties at your yard. However, if you love birds but don’t know how to start the hobby of bird feeding, fret not! There are help that can easily come your way. All you need to do is listen to the experts and enjoy feeding the birds. 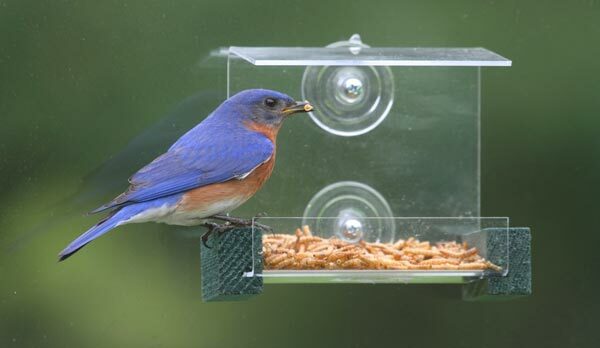 To find the right bluebird feeder, consider the following products rated highly by expert birders. Traditional methods always work, and so does this beautiful wooden bluebird feeder. This product, the cedar mealworm feeder by Kettle Moraine is very easy to use yet sturdy at the same time. 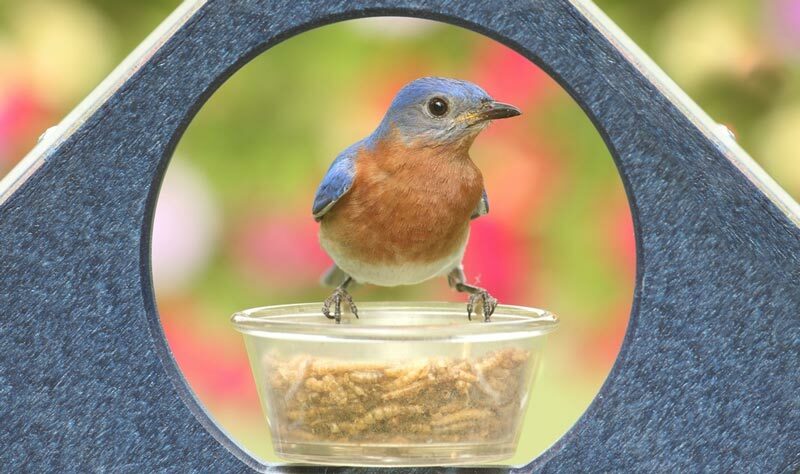 While roasted mealworms are not a problem, as male bluebirds will jump on them fast, the mealworms can get rotten if left uneaten during the rainy months. But the Kettle Moraine Cedar’s roof makes it the best mealworm feeder for blue birds so far. Its size, big enough to accommodate bluebirds but small enough to be used by big bully birds makes it even better. Since you only like bluebirds, you will just have bluebirds. The material is made of solid cedar so the seemingly higher price is justified. The use of cedar makes this small house, with hinged roof the perfect to be used when filling it up with fresh batch of mealworms. I specifically like the way it was built but the only issue that’s somehow destroys the beauty, practicality and functionality of this product is that you need to unscrew some parts to remove and clean the panel on the unhinged side of the roof. Still, expert birders rated it 4/5 for functionality. Want to see bluebirds eating 360 degrees? It is always a fascinating watching them all frantically feeding on, and sometimes fighting for mealworms. 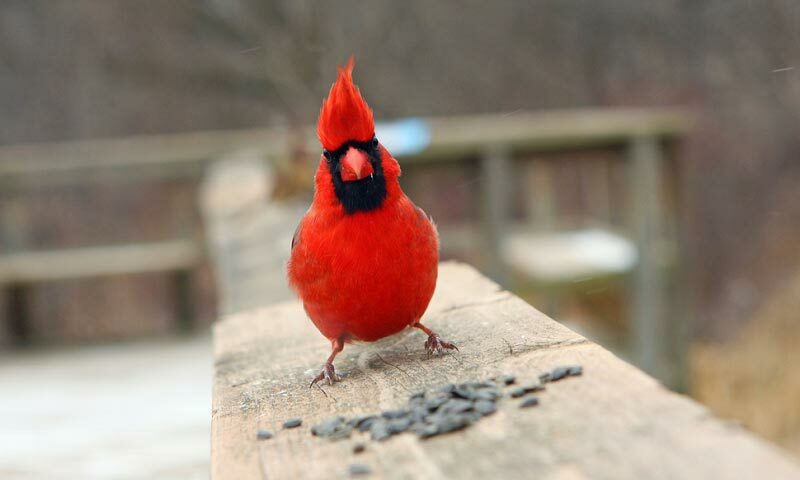 They are the only bird that specifically gets attracted to mealworms. How about keeping the squirrels out of your feeder? Then Erva Tool and Die did a really good job of producing what I think is the best bluebird mealworm feeder. It is not just pretty in its metal mesh design but also functional. The spaces of the metal are just enough to let bluebirds in while bigger birds can just desperately perch on the metal but will never able to reach the worms. Put simply, when the bluebirds are in, the other birds can just wait for scraps. The blue bottom and top is also attractive, complementing the cage-like design. It can rotate 360 degrees depending on how many bluebirds are inside it. Birders who have been feeding bluebirds rated this very high, even if its price is on the high range. The quality and functionality of the product makes every dollar all worth it. An additional treat to the bluebirds will be the jelly, which can be placed at the blue glass in the middle of the feeder. 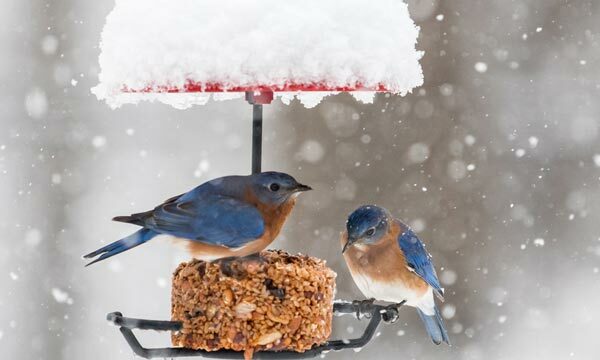 You will have non-stop bluebirds feasting on both sweet and chewy treats. 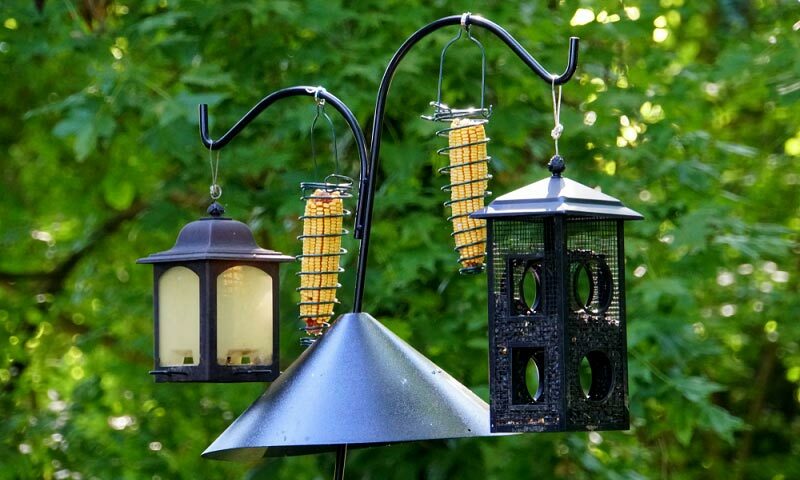 The strong cable attached to the feeder allows you to hang it anywhere, your patio or your yard. Once hanged, enjoy the bluebirds. The only downside is the fact that you need to remove and put down the entire feeder so you can disassemble. Schedule cleaning carefully so you won’t disappoint the regulars when they find out the feeder is missing. 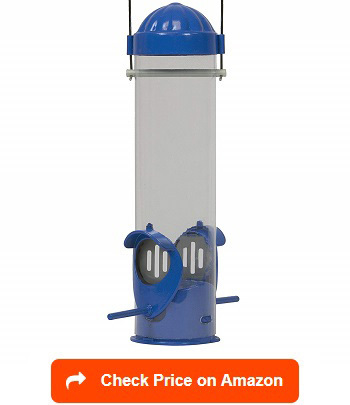 The 38200 bluebird feeder by Stokes Select is what it is – provide a quick snack to the otherwise hungry birds. It is very efficient and practical that bluebirds can wipe it clean everyday. The blue container, made of polycarbonate material, is so sturdy that no strong wind can topple it down. At least according to the birders who have tried the product. What I like about this product is its simplicity, which means that anyone can hang it without the need for a manual. The strong blue color attracts a variety of birds without so much hassle. Certainly, it also looks pretty in the backyard. For the benefit of the birds, the perches are powder coated, which means it can last a long time while giving the birds a peaceful feeding time. I think the only downside of this product is the fact that the blue dish is a little shallow so you might need to re-fill it all the time. Also, because of its shallow size, it is not suitable for live mealworms, as they tend to fall unto the ground even before the bluebirds find them. Still, with its very low price, this Snack ‘N Treat feeder is great for regular feeding and total enjoyment, both of the bird and the bird watchers. Indeed, simplicity is beauty. This mosaic birds feeder made my Couronne Company proved that efficiency can be found in the most simple of things. 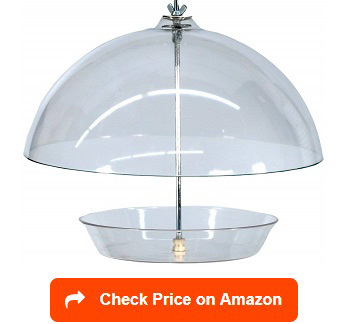 I think what is great about this clear bowl feeder is its practicality and functionality. 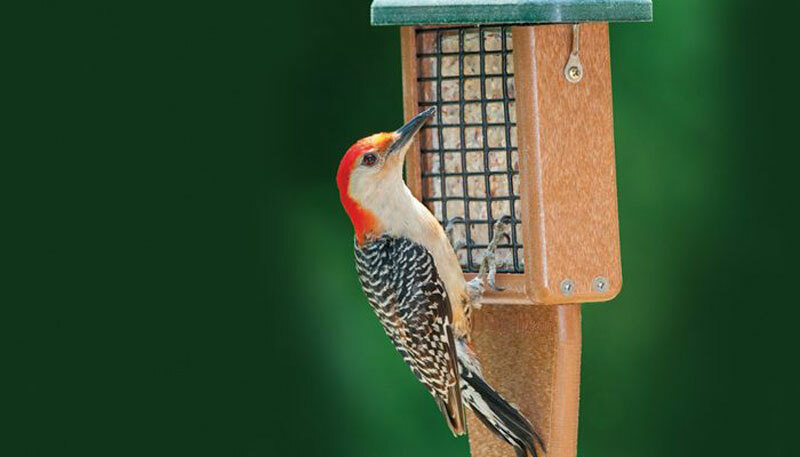 The feeder can hold 3.4 oz, big enough to hold mealworms, suet pellets, jelly, and flower seeds to attract wider variety of birds. 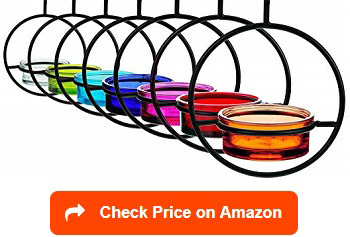 With various colors, you will have your fill of bird fun without having to fill it up so often. 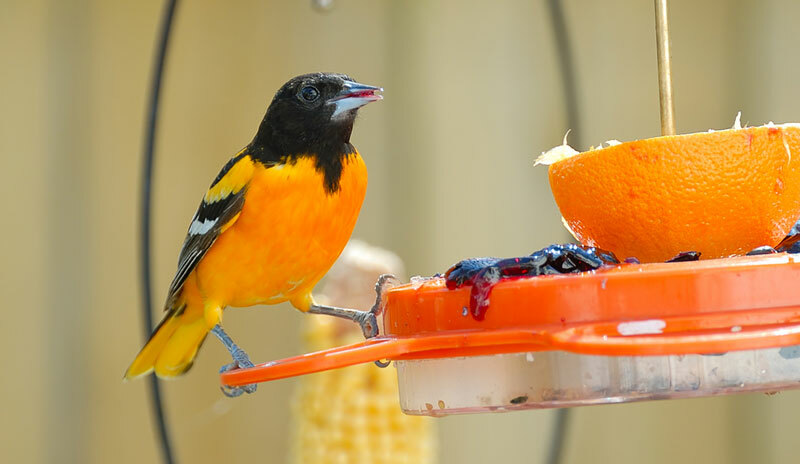 Since it is a bowl of bird treats, you can also combine a variety of food and attract other birds. But if you only want to see bluebirds, then filling it up with mealworms (roasted or alive) will do the trick. The bowls extended edge provides a narrow perch for birds so they can enjoy their food in peace. I also like the open top hook system, which allows connecting few feeders. 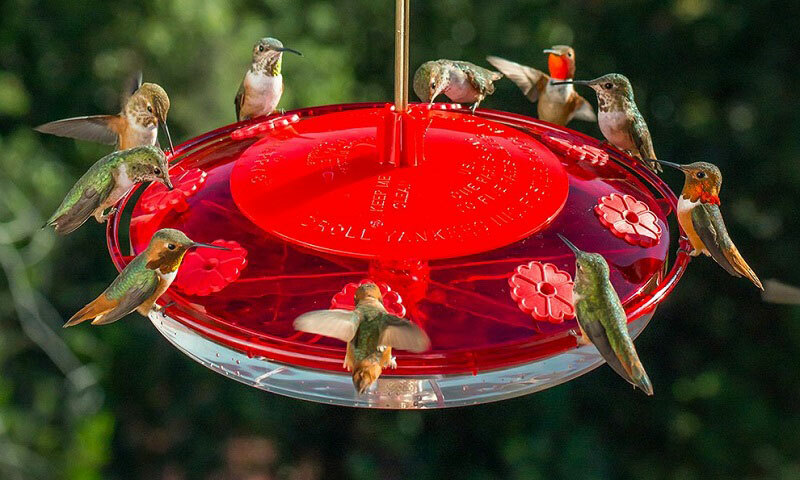 With feeders mesh together, more birds will flock all at once making bird watching truly fun. The glass and metal combination makes the feeder look chic and perfect for a landscaped garden. If not, hanging them on your patio will still do the trick. Bird experts rated the Mosaic Birds so high in the 5 because of its functional features. But, if there’s a downside to this feeder, then it is the fact that it’s not squirrel proof. The open top may attract the pesky squirrels so don’t hang it near ledges, tree branch or anything they can use to reach the feeder. Leakproof dish. It has no drainage so you get the worms or jelly all in place. Obviously, Woodlink has done it again. Considering both functionality and style, I think this product is the prettiest bird feeder so far. This very stylish bluebird feeder is perfect for photography enthusiasts as capturing bluebirds in this elegant feeder speaks a thousand more words than the pictures. Woodlink NABBFDR is made of dome top seed feeder, which means that the tray is awesome to contain a large quantity of mealworms, enough to feed as many as possible. The birds will surely come back for more. 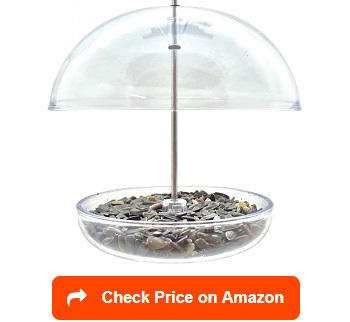 Also, if you also want to see a variety of birds in their glorious colors, then this adjustable dome feeder is your best bet for a dried mealworms container that can also contain other bird food. Let the big birds eat them and then fly away happily after. The only problem is that if you want bluebirds only, then stick to mealworms. While I did enjoy it much, the product, priced at mid-range seems to be worth all the money. Expert birders identified only one issue: the tray is too small if birds come in droves. The tray is too small in case they come in droves. Bluebirds are lucky birds. They have the best-looking feeders being sold in the market. Aesthetically, the Droll Yankees Multipurpose Feeder is something bird feeders will surely find cute. And why not? This small dome made of glass is perfect for small birds including chickadees and finches so on some lucky day, bird watchers just needed to relax and enjoy the combination of brown, gray, red, golden yellow and of course, plenty of hues of blue from the bluebirds. What I truly like about this feeder is its 4.5 inch diameter dish, small enough to accommodate the kind of food such as mealworms or jellies, especially chosen for the kinds of birds and the number of birds that is great for watching. Too many birds at once also results to food fight among them. Its beautiful dome is functional as it protects the food from elements such as rain or even strong wind, this without obstructing the view as it is made of clear glass. Sometimes, it also protects bluebirds from big bully birds as it the dome is low enough to deter big birds from eating the food comfortably. They ended up flying away. 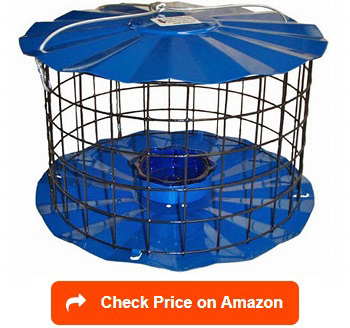 It is also rat and squirrel proof so it can be considered one of the top 10 bluebird feeders too! If there is a downside to the feeder, it is the dome getting bird poop do often. Because waiting birds have to perch somewhere, they will choose to stay on top of it until their turn. Since it is made out of clear glass, cleaning this regularly is recommended. Are you tired of squirrels or rodents stealing your bird food? Perky Pet has the answer to that. 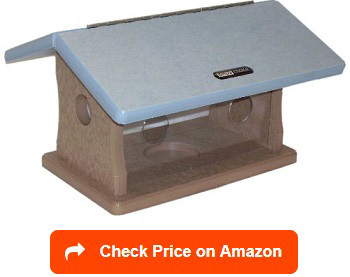 For bluebirds, feeding is easier with the Perky Pet mealworm feeder. The tight container does not let live mealworms to slither away unlike other feeder so everything goes to the bluebirds. I particularly like the design of the Perky Pet as its durable plastic container ensures a better, drier and fresher mealworms yet its removable lid makes it so easy to fill and clean. At feeding time, birds need some place to perch and enjoy their food in peace so the design (with 2 perches) is perfect for small birds. The clear plastic design allows you to monitor the level of food so there’s no need to hurry up for refill. Since it is well-covered, squirrels and rodents will never get into it even if you hang it on a tree branch. The downside of this Perky Pet design may be the size of holes, which can sometimes be too small for the bird bills to take the mealworm out. Finding the high quality bluebird feeder is never easy. There are many considerations such as food, design and even keeping them safe from predators. Kettle Moraine is good with that – keeping everything the birds’ need in their feeder. As a bird watcher, I believe it is always good to invest in a good one. Getting a cedar feeder might just be the trick to get those bluebirds from wandering and come to your feeder instead. This cedar feeder is not just pretty in the garden but it is very functional and practical. Mixing mealworms with bluebird nuggets will certainly be a great way to keep the birds happy while making sure they are far from the danger of larger and aggressive birds. I like that birds enter through the circle opening on the side of the feeder, big enough to allow bluebirds but small enough for unwanted ones. The plexi glass window allows a clear viewing so you won’t miss out any of the fun. The hinged roof is specially designed for easy filling. The only downside of this feeder is that it can be too small to accommodate more birds. For comfort, a maximum of two birds should be inside the feeder at a given time. If you have plenty of visitors in your yard, I suggest that you put few of these to make all your feathery guests happy and filled. This cedar wood feeder is probably the best house feeder ever created. I love that everything a bid wants are in this beautiful little birdhouse. Made from Chinese cedar, this sweetly scented cedar naturally repels pests, fungus and rot, making it to last longer than any other feeder in the market. But what I truly like about it is the feeder’s multilayer, multilevel and multi-feed containers. I can put seeds, jelly, and mealworms to attract all sorts of birds all in one place. I like watching various colors of my pretty flying friends perching and feeding from this cedar wood deluxe bluebird feeder. The blue top roof can be lifted for easy filling. All feed compartments are transparent making it easier to monitor food level so I do not need to worry about whether they have something to feast on or not. Because of its transparent seed compartment windows, the viewing area great – from all angles, literally. This almost perfect design has only one flaw, if you only like bluebirds, then you won’t just get bluebirds as any small birds that fits into the holes for entry and exit can come and join the fun. We feed the birds because we love them. So providing them the best and safest environment is a key to keep them coming back for more. For blue birds, feeding them mealworms is a treat they would surely love. This is why I truly adore the Bluebird feeder by Birds Choice. It is exclusively for mealworms so you will only attract the pretty looking bluebirds around. It’s plexy glass viewing has holes just enough for the bluebirds to get in and out. This means no squirrels, rodents or even other big birds allowed. Bluebirds will then have a peaceful feeding time. The feeder is also made of recycled plastic so aside from taking care of the wildlife, you are also taking care of the environment, which is great! The glass case also provides bird watchers the best view of the colorful blue birds in action. I also like that it is easy to clean and refill. Just lift the top lid to do so. 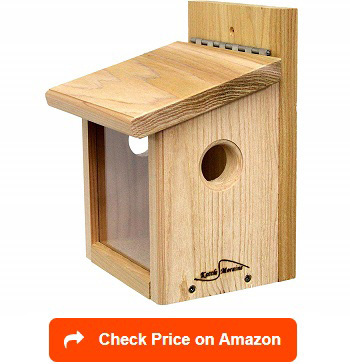 The only downside of this product is that it is small to accommodate plenty of birds at once. In this case, the others have to wait out and perch on the roof, which can make it a bit dirty with bird poop. Overall, it is a good feeder to use only for bluebirds. Among the songbirds, bluebirds are special birds. This is because they do not like hanging out with other birds –especially during feeding time. You will never see these beautiful birds in shades of blue and rusty colored chest fighting for food or taking over someone else’s feeder. Bluebirds can be fed with a variety of bird food. On other cold days, they can have suet, sunflower hearts, softened fruit and corn meal muffins. On other days, they should be given mealworms – considered to be the bluebirds best food. Below are the best foods your bluebird regulars will surely enjoy. Especially during the cold season, the bluebirds need plenty of mealworms. Proteins will keep them strong while the extra fat from the worms will keep them warm. 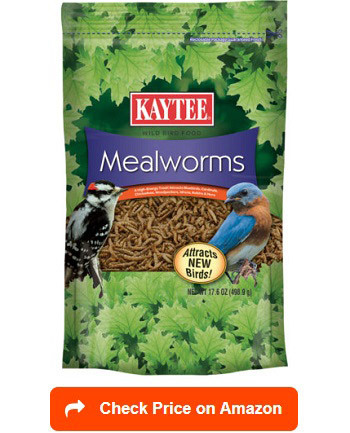 Kaytee mealworm is the perfect choice for bluebirds. The healthy mealworms are good for both nesting and baby bluebirds. Baby birds need extra energy to grow up fast and be able to fledge in due time. But Kaytee mealworm must be so good that other birds are into it once placed in the feeder. As a suggestion, never placed this food beside sunflower feeders so other birds will not bother these cute little bluebirds. Everybody loves nuggets. I do. But so do birds. 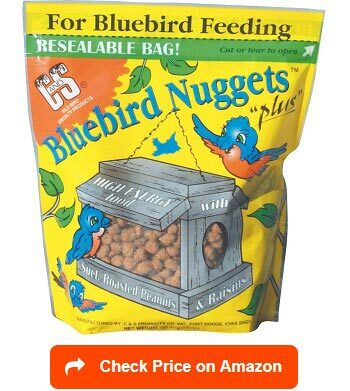 For the best bluebird nuggets, a C&S Bluebird nugget is probably the best choice there is. This nugget contains rendered beef suet, roasted peanuts, raisins, corn and oats. It is always good for the birds to get their dose of healthy snack and this definitely got in the category. The only drawback is that other birds might be interested in it too, so better place this a bit far from the other feeders. Another way to make these bluebird nuggets more interesting is to place it in a peanut feeder, and watch the birds go crazy. Expert birders have a mix reaction on the popularity of this nugget but while not all bluebirds in all places might get familiar with the nuggets, it is always a good thing to try. The raccoon and chipmunks like to ransack it. Watch out. The idea of taking care of a bird is a fascinating one. You can always look at it from the perspective of someone trying to get that fun and enjoyment of watching birds do their tricks while feeding. The use of bird feeders is a good way to attract birds into your garden. 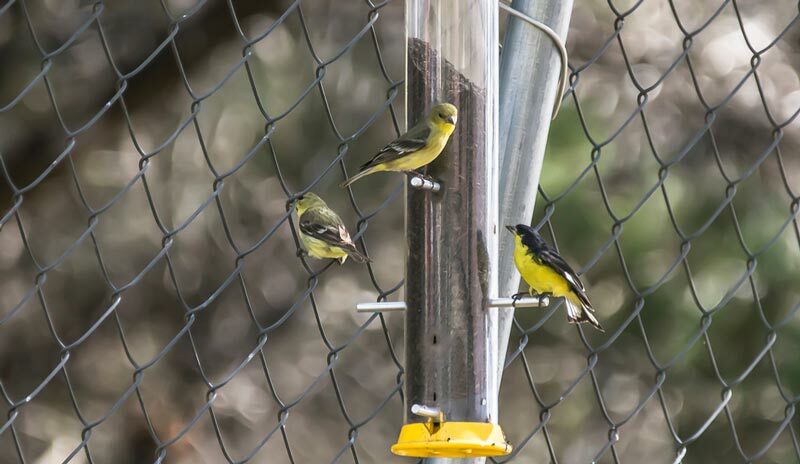 Before buying a feeder, you need to consider several things including food, functionality and practicality of the feeder. The House Feeders. 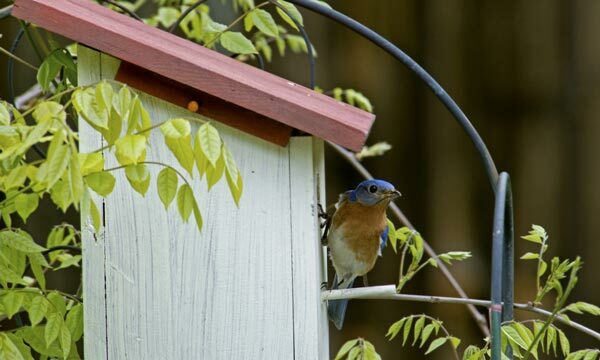 Some bluebird feeders look like tiny houses and they add value to your beautiful garden. Aside from the design, this kind of feeder protects seeds against the possible problems of weather and even bird droppings. Taking care of the health of the birds, you need to make sure that the food (mealworms, suet or even nuggets) does not get wet. Wet food can rot easily and bacteria and fungus will begin to thrive. House feeders are convenient because you can place enough food to last few days but they are harder to clean than other feeders. Unfortunately, it is not squirrel proof so placement of it should be well thought of. Never place it near tree branches or ledges that squirrels can use to climb. Capacity. Even if you are only attracting bluebirds, you still have to consider the capacity of your feeder. A smaller feeder capacity means refilling it often. You better get a bigger one so you can rest and enjoy watching them eat happily. Viewing. We all want our feeder to be squirrel or rodent proof, which means that it should be safer for the bluebirds during feeding time. 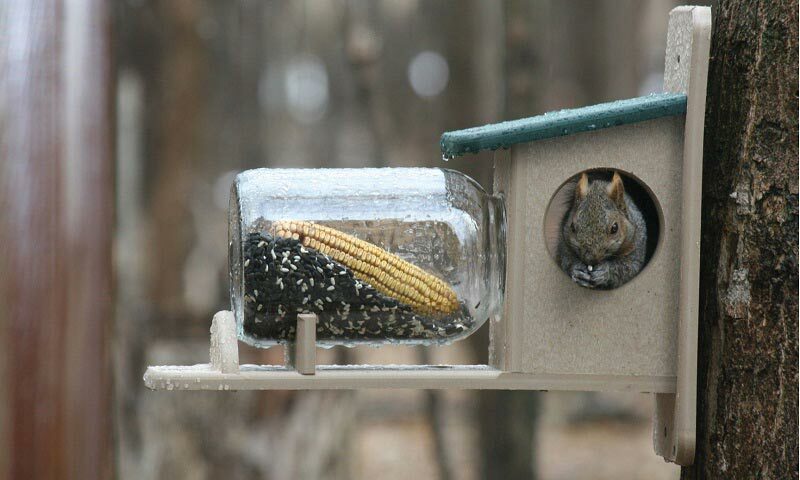 But the proof should not obstruct viewing so getting a feeder that has glass window is great. 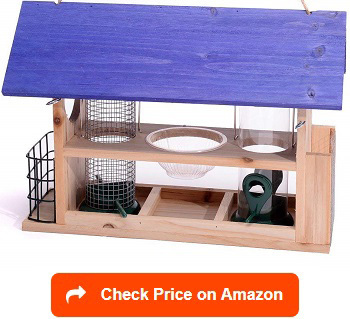 How to hang bluebird feeder? 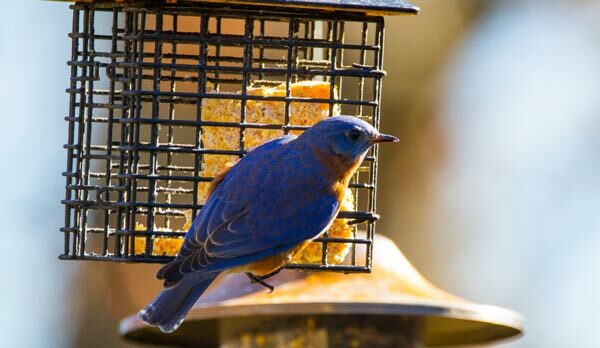 If you are a big fan of bluebirds, buying a bluebird feeder is the first step. Second is to decide where will you place or hang it for the birds to notice it right away. Third is to keep it occupied, which includes cleaning and refill schedule. Of course, hanging the bird feeder is considered the easiest way to attract the birds. The feeders will be within their flying vision. Feeders can be hung from anywhere but if you want the birds to find the feeder fast, perhaps you can hang it in hooks, open garden, arches, and trees. Your patio (if you have a big one) can also be another location. The purpose is for the birds to see and for you to watch the birds comfortably. While thinking of the where, the height of the feeder from the ground is also important. An additional height will mean protection from predators. 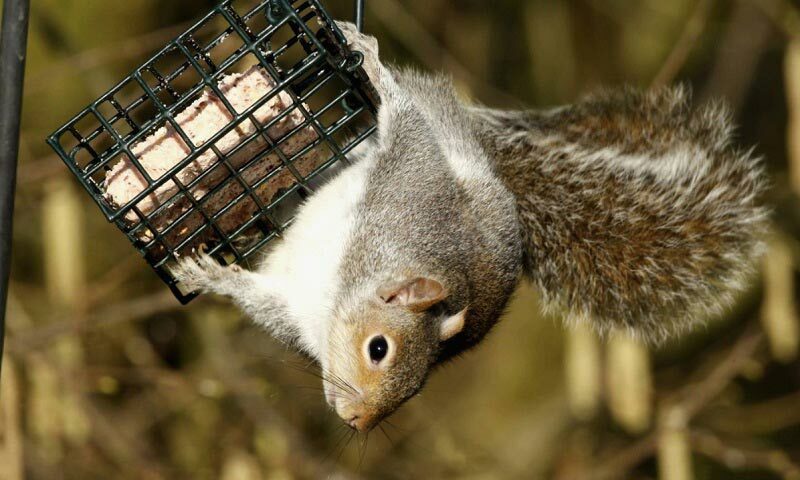 Hanging feeders are also more effective to keep the rodents, squirrels or other wildlife animals to access. 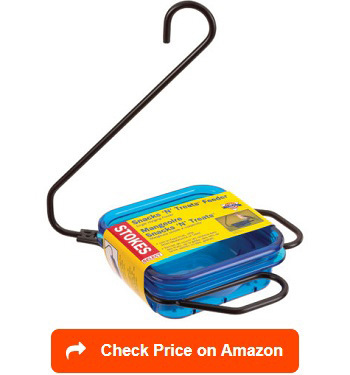 To hang the feeder securely, you need to make sure there’s an S shaped hook to keep it steady or a cord to hang it securely, observing the proper height distance. Will bluebirds eat dried mealworms? Yes. But bluebirds can be picky too. They do not eat the dead or the mealworms that are already black in color. In fact, mealworms are considered to be the best food to feed the bluebirds. Feeding them dried mealworms is good but expert birders concluded that they do not provide complete nutrition so supplementing it with other food will be best for their health. Some experts claim that mealworms can deplete their calcium so offering mealworms at limited quantities should be enough. How to make a mealworm bird feeder? Attracting bluebirds with mealworms is always a good way to go. While blue birds primarily feed on insects, fruits and berries, they can be very fond of mealworms too. So, if you want them to stay in your yard, making your own bluebird feeder can be your best bet. There are many mealworm feeders available in pet shops but customizing your own feeder according to the kinds of birds, presence of predators as well as number of birds visiting your yard may be a better option. In making your own mealworm feeder, some considerations may be needed. The key to a good mealworm feeder is the entrance and exit holes. It must at least be 1 to 1 ½ in diameter to keep the small birds in but the larger one out. Create an enclosure, which can be glass or a durable plastic. This will make your feeder predator proof. Lay out the design. A house design is always a cute one. Drill all sides of the design and put them together, except the top portion. Make hinges on the roof so it can be opened for easy refill. What do bluebirds eat beside mealworms? There are several species of bluebirds present in areas like North America: the Eastern, the Western and the Mountain bluebirds. So, depending on where you are, you might be getting a different variety in your backyard. Still, feeding them dried or live mealworms is a good food choice but they can also eat bugs, berries and fruits. They will never fly to feeders offering seeds though. Combining these foods in their feeder will surely make them very happy and the watcher doubly happy too! The feeder preferences of bluebirds can sometimes be tricky. Because they are small, they get easily scared away by the feeders intended for big birds. This is the reason why getting the best bluebird feeder as well as placement of it is important. 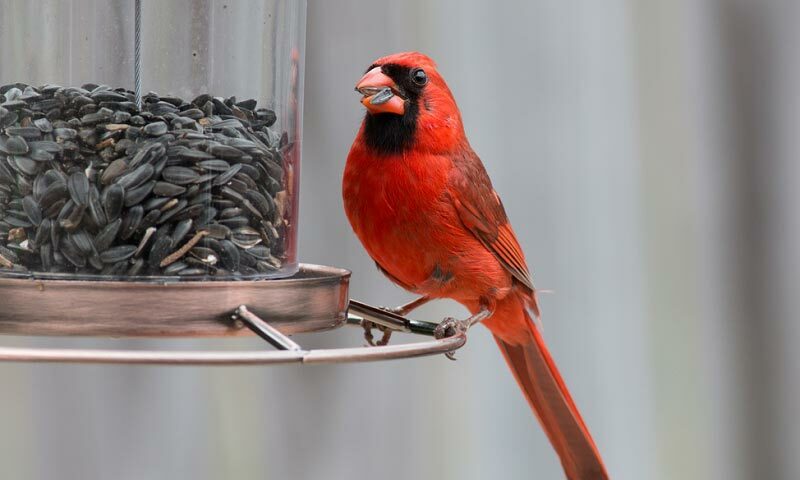 As a rule of thumb, never place it too near other bird feeders, especially the ones carrying birdseeds. 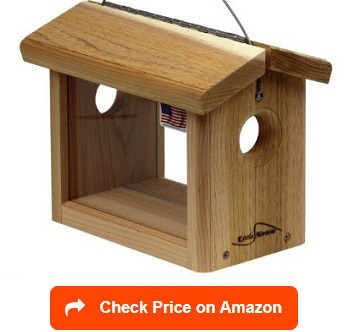 But once you found the perfect bluebird feeder, bird watching will never be the same again.